This report was commissioned by the Australian Government’s Department of Climate Change and Energy Efficiency (DCCEE), with the cooperation of the Government of India’s Ministry for New and Renewable Energy (MNRE). 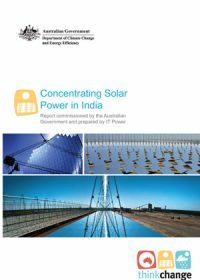 This report analyses the context, barriers and policy options for the growth of the concentrating solar power (CSP) industry in India, for use by government policy and program implementation staff in both countries. It may also be of interest to others such as CSP developers and investors.